Create picture-perfect printed art with this handy guide from Route 1 Print. You invest a huge amount of effort, time and resources into getting your designs right. So, the last thing you want is for them to come back from the printers looking less than perfect. That said, it’s easy to get swept up in the creative process and forget about how your artwork will translate in to print. But leaving these considerations until the end of a project can lead to costly mistakes, which is why having a deep understanding of the print process and how it can add value to your artwork - and therefore your clients - is vital. And that’s where this free booklet from Route 1 Print can help. A fantastic resource, this handy-sized guide explains and showcases multiple ways in which print can really compliment a design. Each page of the booklet features expert advice about the print process, all of which is printed on various different stock and finish choices, providing tangible examples for you to feast your eyes and hands on. Stock options include Mohawk Felt Cream, Ice Gold and Kraft Paper. There’s also Spot UV examples, as well as matt, gloss and soft touch lamination finishes. All you have to do is choose the print option best suited to your work and flip the page for details of the exact colour and gsm (grams per square meter). The third and final chapter of Route 1 Print’s guide, Clashes, highlights the designs and printing methods that don’t get along quite so well, and why you should try to avoid the use of excessive ink and Spot UV where possible. 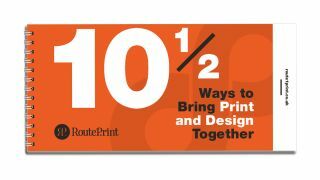 All in all, 10½ ways to bring Print and Design Together is a comprehensive guide to the print process. It’s (almost) pocket size means it will won’t take up much room on your desk and easily fit in most bags if you need it for reference on the go. And the best part? It’s totally free! So, what are you waiting for? Get your free booklet and have all the print advice you’ll ever need at your fingertips.